Red Hat Summit for the year 2017 has come and gone and once again, I am reminded why it is easily one of my most anticipated weeks of the calendar year. 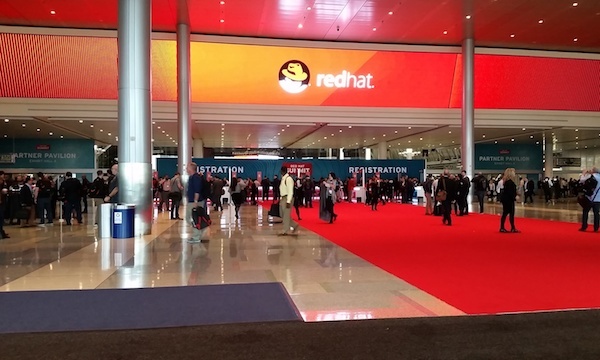 My job at Red Hat allows me to collaborate with many different groups within the organization, but considering the distributed nature of Red Hat, Red Hat Summit offers the opportunity to reconnect with colleagues face to face. More importantly, Red Hat Summit provides a medium to share my knowledge and experience working with open source technologies to the masses. This year, I was fortunate to facilitate two hands on labs, one of Red Hat Summit’s unique offerings. Hands on labs afford attendees the option of using several different types of technologies first hand from the experts who work on them on a daily basis. In addition to the labs, I also facilitated a session at the Red Hat Consulting discovery zone smack dab in the center of the action in the partner pavilion. The rest of this post provides an overview of my sessions at Red Hat Summit 2017 along with the associated assets. Technology continues to surround as each day goes by. Many of the devices around our home, work and school are connected to the Internet and thus know as the Internet of Things (IoT), On the first day of Red Hat Summit, I was fortunate to work with the brilliant Ishu Verma, Red Hat’s IoT technical evangelist, to produce a hands on lab that allowed attendees to containerize an IoT solution and deploy the solution on the OpenShift Container Platform. The contents of the lab along with the standalone version of the project are both found on GitHub. Full instructions on how to replicate the solution are available. On day two of Red Hat Summit, I took a break from the lab room and jumped in feet first and presented a session on Container Driven Continuous Delivery with Red Hat Architect Raffaele Spazzoli at the Red Hat Consulting discovery zone booth. One of the questions that we continue to hear from our customers is the methodology that should be used to implement Continuous Integration and Continuous Delivery when working with OpenShift. The session highlighted several different strategies and toolsets that we have found to be effective to enable developers and organizations to be productive. On the final day of Red Hat Summit, the action once again returned to lab room for one of the most advantageous projects that I have been apart of. My focus these days primarily centers around the OpenShift Container Platform and how customers both across the United States and around the world are deploying and using it. A common theme that I hear at many of these customers is how to properly manage the platform. The key is to use the right tools and to have the proper automation that can help streamline the process. Those themes were an integral part of this lab as attendees were immersed in many of the tools that can help solve their automation and management challenges. Ansible Tower acted as the management layer for the installation and ongoing maintenance of the OpenShift Container Platform. Attendees used Ansible Tower to install OpenShift on top of Red Hat OpenStack. Once the platform was installed, a containerized version of Red Hat CloudForms was deployed on top of OpenShift and integrated with both Red Hat OpenStack and Red Hat OpenShift Container Platform to provide a single pane of glass over the entire infrastructure. Since OpenShift is also a developer platform, it only made sense that attendees were able to take their operator hats off and act as a developer and deploy a sample application. As they deployed the application, metrics on the underlying health of the platform and the newly deployed applications could be viewed in CloudForms. Finally, coming full circle, attendees once again returned to Ansible Tower to kick off a job that dynamically scaled the number of OpenShift nodes. Putting this all together was no easy task. I was fortunate enough to work with several Red Hat rockstars: Scott Collier, Jason DeTiberus and Vinny Valdez. It was two action packed hours that introduced many technology and products that attendees had yet to get their hands on previously. Both the automation tooling and the guide that was utilized by attendees can be found in the GitHub repository. All and all, it was an immensely successful Red Hat Summit. This year was my first attempt at a lab session (2 in fact) and it ushered in new experiences of Summit that I will never forget. I am already looking forward to Red Hat Summit 2018 which once again returns to San Francisco May 8-10. I hope to see you there too!